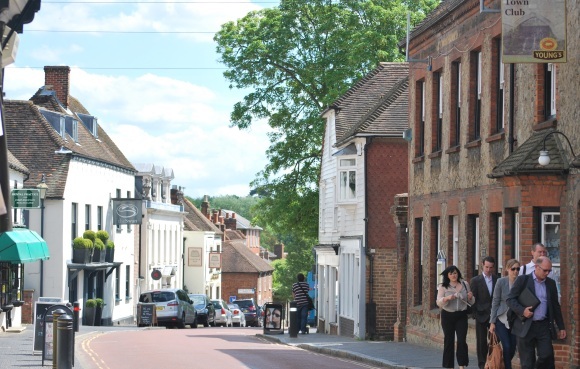 West Malling Local Shops Blog: Why not tour West Malling this weekend - on foot! Why not tour West Malling this weekend - on foot! As the Bank Holiday weekend approaches most of us will be planning activities for the extra holidays. 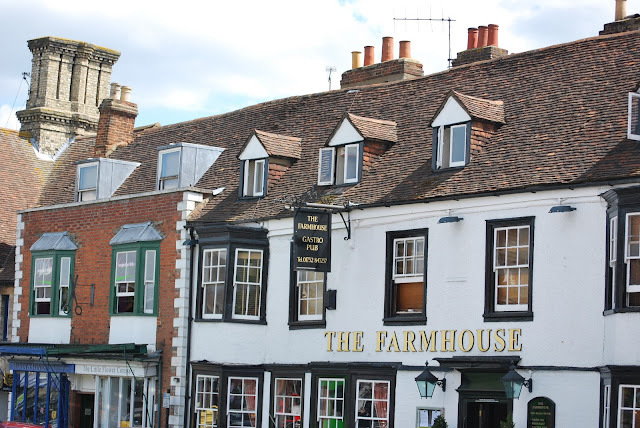 Instead of getting stuck in the bank holiday traffic as you head out of town, why not search for hidden treasures on your very doorstep and take the West Malling Walking tour? West Malling is a medieval town with a fascinating history, and there are plenty of sights to see if we just take the time to look for them. 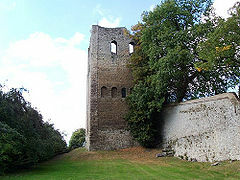 Start your tour at St. Leonard’s Tower at the south end of West Malling, opposite Manor Country Park. This tower was built by Bishop Gundulf of Rochester around 1080 as a symbol of the might of the new Norman regime, and a secure administrative centre for the parish. Continue up the road past Douce’s Manor, a mansion built in the eighteenth century on the site of a Tudor farmhouse. During the Second World War this was the headquarters for officers from RAF West Malling, and their candle smoke signatures can still be seen on the ceiling of the Twitch Heritage Centre in the basement. 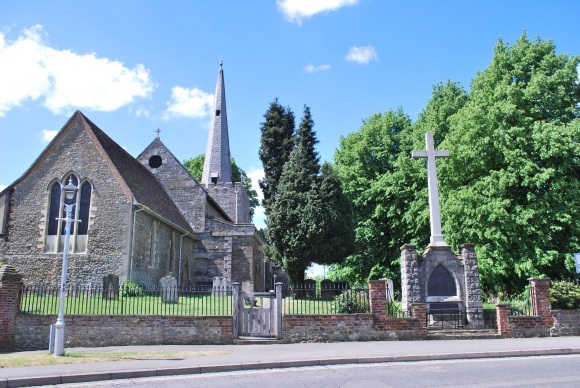 As you approach the town centre the Norman church of St. Mary the Virgin stands on the highest ground in the area with its needle tower which was rebuilt in 1838. 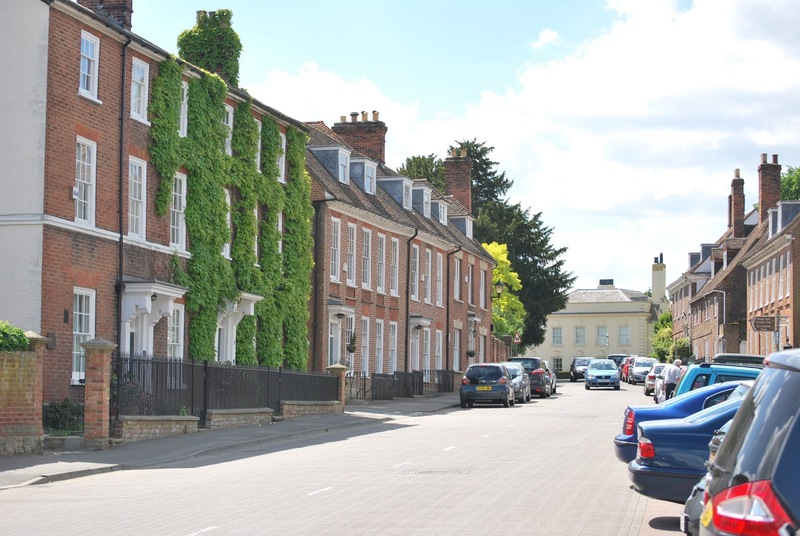 Further along the road on the left you’ll see the seventeenth century façade of the Tudor House which hides a medieval interior, as well as the town pump, the eighteenth century gothic Old Vicarage, and two original Georgian town houses, Forsters and Wisteria House. 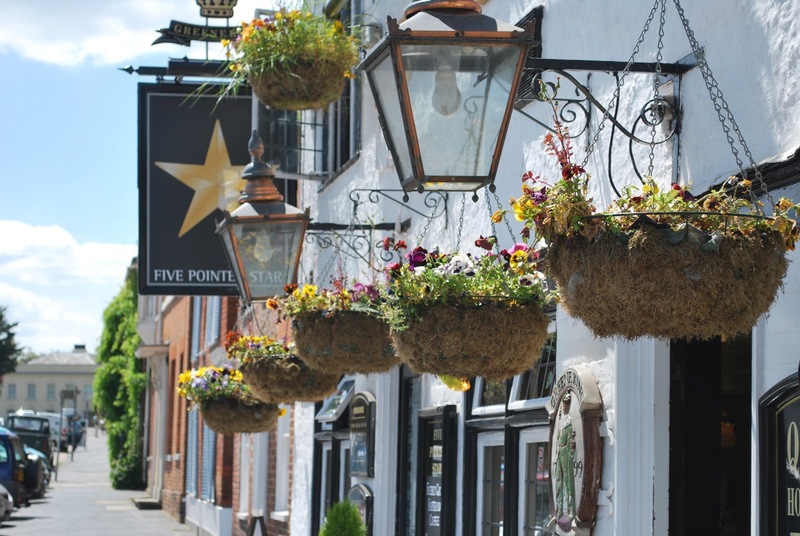 Of the two pubs that face each other at the top of the High Street, the Five Pointed Star was probably the first, constructed around 1380 as a farmhouse where ale may have been brewed. Across the road The Farmhouse, formerly known as The Bear, was a coaching inn famous for a Twisden family duel around 1700. Continue along the High Street and turn left down West Street where you’ll see The Colonnade, a former malt loft and wagon shed with first floor doors. Turn right along King Street, an ancient Droveway which runs parallel to the High Street. Here you’ll see medieval timber framed buildings with jettied cross wing fronts including Avicia Cottage and The Prior’s House. Many buildings on King Street hide medieval structures behind more recent brick facades. Continue along the High Street and turn left down West Street where you’ll see The Colonnade, a former malt loft and wagon shed with first floor doors. Turn right along King Street, an ancient Droveway which runs parallel to the High Street. Here you’ll see medieval timber framed buildings with jettied cross wing fronts including Avicia Cottage and The Prior’s House. Many buildings on King Street hide medieval structures behind more recent brick facades. 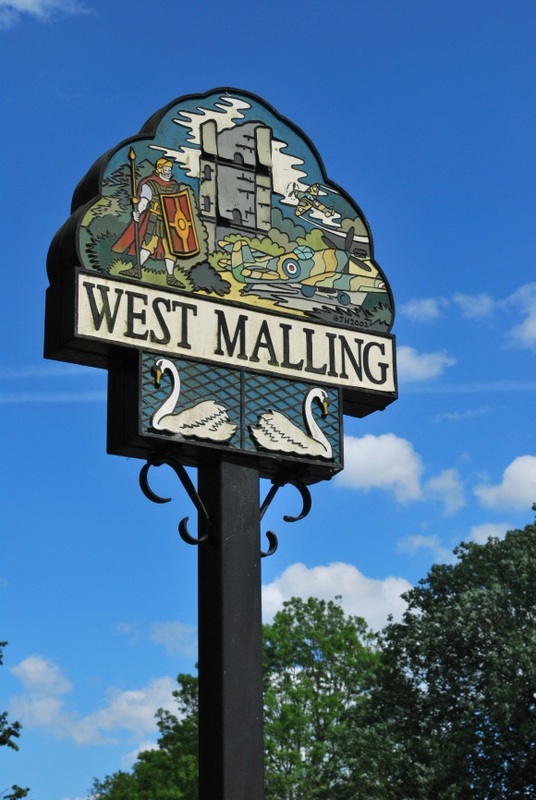 Re-join the High Street on the green at the end of King Street and take a look at the West Malling Village sign commissioned by the Malling Society. One side shows Bishop Gundulf overseeing the three local Norman towers, while the other shows the cricket match described in Dickens’ Pickwick papers which is believed to have been set in West Malling. You can also see the Millennium bronze sculpture of hope. Across the road the Bull pub is part of an original fifteenth century farmhouse, which was partly demolished when the railway arrived in West Malling. Heading back along the High Street towards the centre, have a look at the fifteenth century house that is now Franks Mussel Bar. In the outer wall at pavement level there is a carved stone figure which is all that remains of the original Market Cross. On the other side of the road were the eighteenth century Assembly Rooms which housed a grand ballroom upstairs, and were later used as a Masonic temple and a magistrate’s court. constructed to house important visitors to the Abbey. Further down Swan Street you’ll find the Abbey itself which was a nunnery founded by Bishop Gundulf around 1090. You can still see the original west tower from Swan Street, and the Cascade which originates from the late eighteenth century. On the opposite side of the road Went House and its railings are one of the best examples of Queen Anne architecture in Kent. at the West Malling library. We hope you enjoy your walk around West Malling.